RSVP to the Oasis Garden Tour! We hope to see you there! For a larger, printable version of this flier, please click here: 3rd Garden Tour. 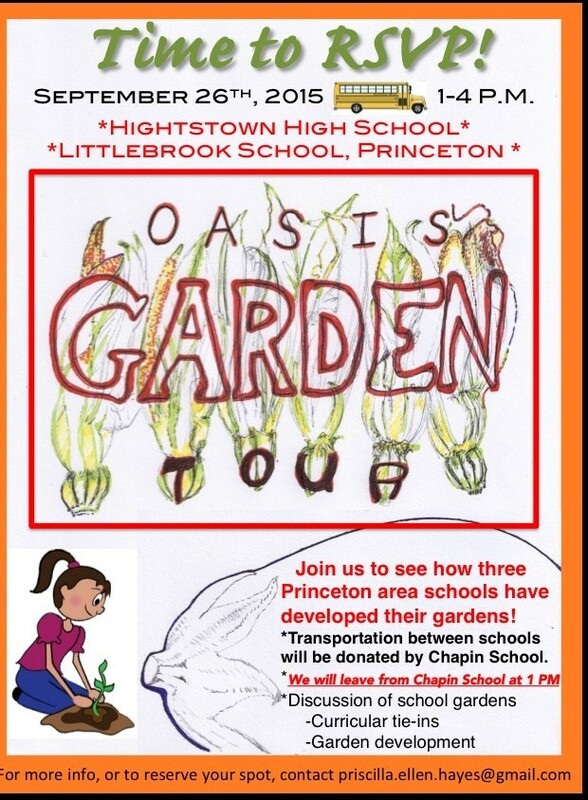 Author priscillahayesPosted on September 22, 2015 September 22, 2015 Categories GardensTags Community Gardens, gardens, Princeton, school gardens, studentsLeave a comment on RSVP to the Oasis Garden Tour! At the end of last year, the first grade teachers at Littlebrook School started planning a bird garden as a service learning project for their classes with design ideas from Littlebrook’s fabulous art teacher. We are converting an existing bed which already contains plants that support birds, so the kids will be drawing plans to add additional bird-friendly plants from a pre-selected list. Creating a successful bird garden is more than just adding plants—it’s learning to look at both the existing and new plants from a bird’s point of view. I am learning that this requires unlearning or rethinking some things that have become almost second nature to me as a gardener. • Joe pye weed—per CREP publication, the seed is an angular nutlet providing food to songbirds; look for chickadees, wrens, titmice and juncos; the fluff is used for building warm nests. • Goldenrod—benefits songbirds; birds eat seeds; insects use it to overwinter, so birds can eat the insects, also. • Sedum—all sedum varieties popular with pretty much all types of seed eaters. • Globe thistle—especially popular with goldfinches; not an aggressive plant. My research also showed that some weeds, notably smartweed, produce a large amount of seeds per plant, attracting red-winged blackbirds, cardinals, sparrows and others. While I am not really advocating planting smartweed, I have a collection of seeds as they become ripe on the turnpike overpass where we bike in mind. I figure that I can move the ripe seeds to a bird feeder, since it is unlikely that they will get eaten on that hot, noisy, open overpass. But not every bird eats seeds. If you begin to study the shapes of birds’ beaks, you will begin to see that some birds have the right beaks to eat seeds, and others have beaks that are appropriate for collecting and eating something from the animal kingdom (of course, some things eat both plant and animal things, as we do). Insects and other small crawlies are among these foods, so another important change in gardening habits is to learn to tolerate some level of insects chomping away on garden plants. Many of these things, including caterpillars, are foods for birds we want to see. In fact, the presence or absence of enough of these may help determine how many eggs are laid and how many young birds can be successfully raised by adult birds nesting in a given area. This has proved more slippery to embrace than the no-deadheading protocol change. We are wondering if the reason we aren’t seeing many of the Black Swallowtail caterpillars this year is because we have a bird population that is too efficiently picking them off and eating them. We really do like Black Swallowtails—they are one of two butterflies especially studied by the second graders, and we don’t mind sharing our parsley and fennel with their caterpillars. On the other hand, no birds seem to be eating the cabbage worms we are seeing on our collards. Are Black Swallowtail caterpillars the caterpillar of choice for birds with discriminating palates? We have taken to squishing the cabbage worms (and drowning Japanese beetles) since nothing is eating these for us. Figuring out how to provide insect food for birds is going to be a real learning process for us humans at Littlebrook School. As I was introducing the fifth graders to their Freedom Garden (instead of a bird garden) for this year, the teacher I was working with pointed out an adult male and a juvenile goldfinch eating coneflower/Echinacea seeds in one of our pollinator borders. With her impressive birding skills, she could tell that the youngster was trying to get the adult to feed it, and the adult was saying the youngster was old enough to feed itself. I was reminded of how much I still have to learn about the natural world, but at the same time, a mystery was solved for me. Last year I collected Echinacea seedheads with the second graders from that very border and we seemed to come up with almost no seeds or fully pollinated, viable seeds from the seedheads. The finches in the courtyard explain why—they had already picked out most of the seeds before we even got to the seedheads. I love my job for all of these constant little insights every day, and even just the gift of noticing things, like goldfinches, that were there all along. WHAT’S YOUR FAVORITE VARIETY OF VEGETABLE TO GROW? The title of this post is the question that Shanyn Siegel asked us at the start of our most recent Seed Saving class at Duke Farms, a session that was entitled “Garden Smarter: Vegetable Varieties for Gardeners.” Two of my fellow class members offered as favorites the Brandywine tomato (there may have been another part to the name) and a Rattlesnake bean (again, there may have been another qualifier, but this is what I got in my notes). I mentioned the Principe Borghese tomato, which I grow almost exclusively, because I try to dry a lot of tomatoes each year. Most people didn’t offer a favorite, which went to the point Shanyn was trying to make, which is that most of us don’t pay attention to vegetable varieties. Who hasn’t seen packets of seeds, she asked, in the big box stores, that say simply “Eggplant,” as though there were only one variety. Large national seed companies try to offer seeds that will grow pretty well anywhere in the country. But the same variety of plant doesn’t do equally well in all places, and the trick is to find something that is well suited to your own climate and growing conditions—for instance, here in New Jersey we have a fairly short growing season, high humidity, and lots of disease pressure. But even more than place, you will need to determine whether what you are going to grow is well suited to your personal needs as a gardener. If you didn’t think you had personal needs as a gardener, it is helpful to review some of the questions that Shanyn suggested at the class: are there times in your gardening life when you don’t or can’t get into your garden for a week or so, and thus don’t weed, or water, or feed, or harvest? Then you need to be looking for plants that will stand the neglect of whatever period you anticipate giving them. Then there is the question of how are you going to use the produce—Shanyn likes things she can munch in the garden, or use with a minimum of prep, rather than things that require a lot of cooking before use. Do you want things to mature all at once, so you can do a big harvest production like canning, or do you want things to come in a few at a time, so you can use them over a longer period of time, similarly a few at a time. Do they store well, and is this important to you—red onions are tastier for salads and other similar uses, but don’t keep as well as white or yellow onions. There was a lot more to learn at this class, and like all the classes in this series, it has been a really eye-opening experience, and so obvious once you get it. But Shanyn went on to introduce us all to an online resource she wanted us all to start using, the Cornell University Vegetable Varieties for Gardeners site. Here you can read reviews of vegetable varieties from real-life gardeners who have grown the same vegetable variety you may be contemplating. Most useful, of course, will be reviews from others in your geographic area or under otherwise similar gardening conditions. For many vegetables, there are not many reviews, which is why Shanyn wants everyone to start putting in lots of feedback, so we will all have more to draw on. For example, the most reviewed vegetable variety, Sungold Tomatoes (which I ate at our seed garden and now HAVE to grow) has only 98 reviews to date—interestingly it is not the site’s top rated variety, or even in the top five. To get started, you create a garden profile and name for your garden; the profile includes your name, etc., your garden experience level, and then your garden’s location, frost free days (that needed a call to the local Extension office; I note that another local gardener does have a different estimate), soil texture and sun exposure. 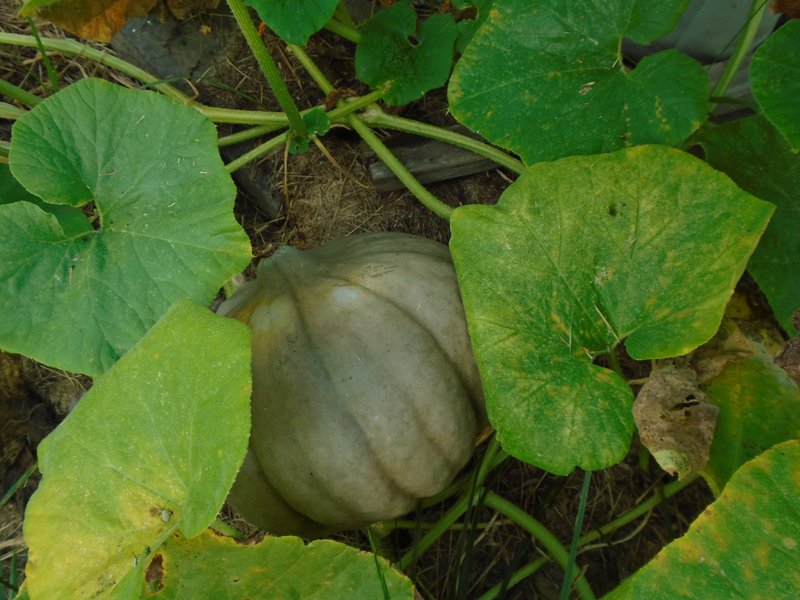 I looked up Uncle David’s Dakota Dessert Squash, which I had gotten only as a substitute for a pumpkin that was out of stock, but which was growing in an exuberant fashion before someone ran off with our developing squashes from one of my more open school gardens. There weren’t any New Jersey reviews, so of course, I am planning to add one, assuming I manage to keep any squash through maturity as a winter squash, without it disappearing with someone who thinks it is a summer squash. Speaking of squashes, as in many years past, I am growing “mystery squash” in my garden—on a plant that has erupted out of the compost bin and sprawled across the front of a couple of garden beds. I have observed that the plants behind it seem less nibbled on than similar plants elsewhere in the garden, leading me to believe that the Native Americans were right when they thought it would give some protection against animal moochers in their Five Sisters gardens. 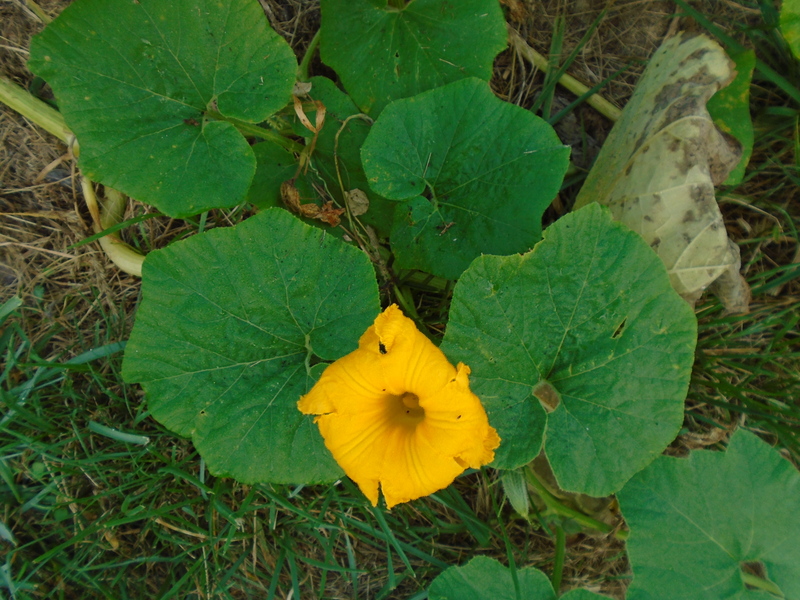 I attach two photos of the squash and a flower—note the bump on the bottom of the squash, rather than a flat pumpkin-like bottom that you might expect from such a pumpkin like squash. Any ideas out there on what variety I am growing? Author priscillahayesPosted on September 1, 2015 September 1, 2015 Categories GardensTags Cornell websites, Seed Saving, vegetable varietiesLeave a comment on WHAT’S YOUR FAVORITE VARIETY OF VEGETABLE TO GROW?